Dual: 5 on 4.5" | 4.75"
Includes rotors, hubs, bearings and seals, calipers, caliper brackets, hardware, and pads. 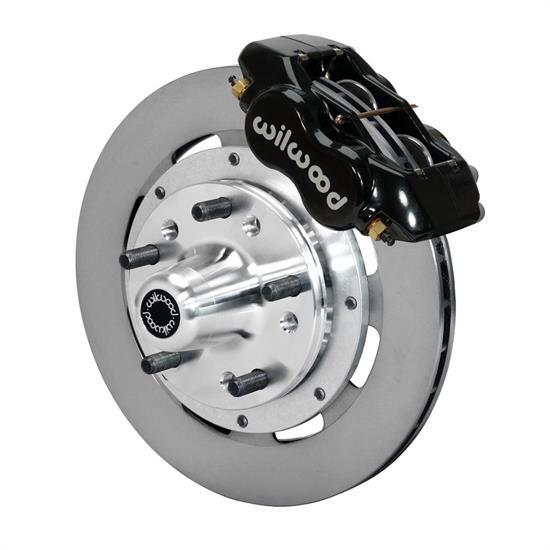 This heavy duty Wilwood brake kit is just the ticket for your '55, '56 or '57 Chevy car. Features 4-piston billet Dynalite calipers, aluminum hubs, 11-3/4" vented rotors and required brackets and hardware. Calipers have 1/8" NPT inlet. Works with 15" and larger wheels. Note: For stock 1955-1957 Chevy spindles ONLY - will not fit 2" drop aftermarket spindles. If using steel wheels with this kit, you will also need to purchase (2) steel shims part 835-3007500. These shims will prevent steel wheelsfrom galling the aluminum hub. OEM rubber brake hoses generally cannot be adapted to Wilwood calipers. The caliper inlet fitting is a 1/8-27 NPT. The preferred method is to use steel adapter fittings at the caliper, either straight, 45 or 90 degree and enough steel braided line to allow for full suspension travel and turning radius, lock to lock.